Designed in 1910 by Frank Matcham, the London Palladium is a huge, opulent palace of laughter and the traditional home of variety. Nowdays though it hosts pantomimes, concerts and large scale musicals. Exciting, fresh and light in atmosphere the marble-pillared foyer is dominated by wide stairs and brass handrails. Between the pillars supporting the main entrance, audiences are met at the doors by liveried ushers – a proper start to an evening of theatre! 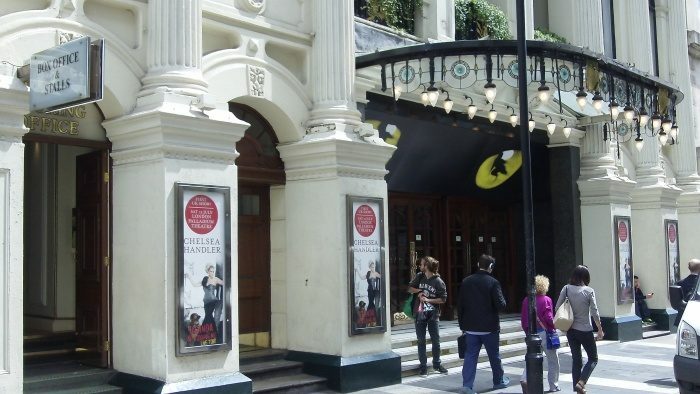 Theatre Bars – 4 The Variety Bar (Stalls); The Val Parnell Bar (Stalls); The Cinderella Bar (Royal Circle); The Long Bar (Upper Circle).